Landfills produce two byproducts: leachate and landfill gas. Freshkills Park has collection systems designed to capture and treat these byproducts. The collection systems are maintained by the Department of Sanitation (DSNY) and overseen by the New York State Department of Environmental Conservation (DEC). The systems will be decommissioned once monitoring data collected by DSNY and reviewed by DEC shows that they are no longer needed. Landfill gas wells extend down into the waste layer. The bottom of each well is perforated to allow particles of landfill gas inside. The vertical wells are connected to a network of lateral pipes, which are connected to nearby flare stations and a landfill gas purification plant. Landfill gas is created as anaerobic bacteria feed on decomposing waste. The gas is a mixture of methane, carbon dioxide, and small amounts of non-methane organic compounds (NMOCs). The landfill cap prevents landfill gas from migrating into the atmosphere. 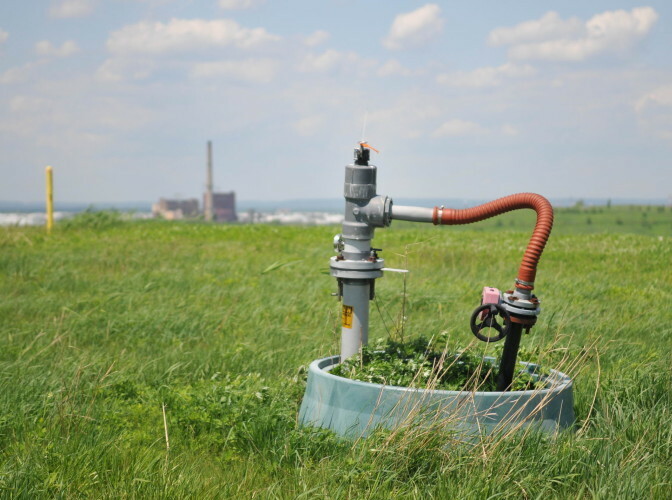 Below the cap, a network of wells, pipes and blowers collect landfill gas from the capped landfill mounds and send it to an onsite purification plant. Prior to 1982, the landfill gas at Fresh Kills was burned before being released into the atmosphere. Combustion transforms the methane in landfill gas into carbon dioxide, which is less harmful to the atmosphere. Since 1982, the landfill gas has been treated and recycled instead of burned. Landfill gas wells extend down into the waste layer. These vertical wells have holes that allow particles of landfill gas inside. The wells are connected to a network of lateral pipes, which are connected to nearby flare stations. The three flare stations at Freshkills Park can be easily identified by their large white stacks. The flare station blowers create a vacuum that pulls landfill gas into the vertical wells and through the network of lateral pipes to a purification plant. 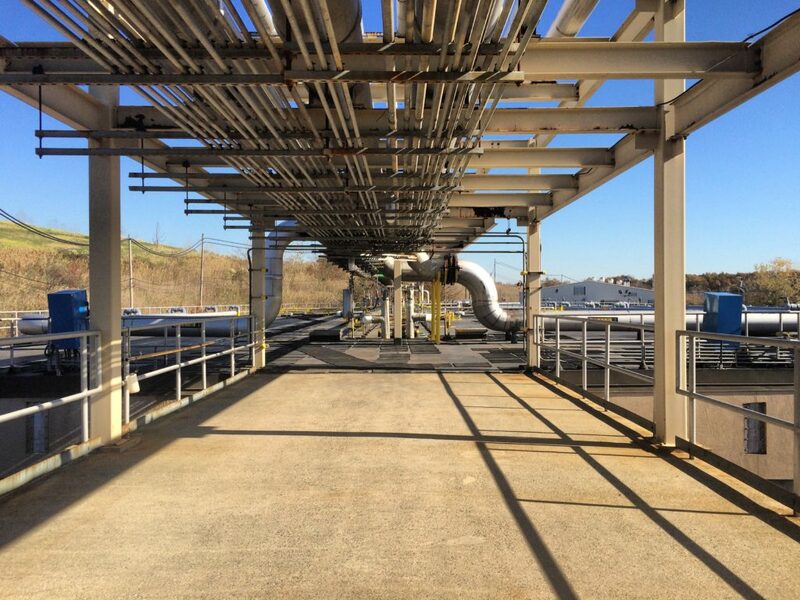 At the landfill gas purification plant, the gas is refined into pipeline-grade natural gas through a series of physical and chemical reactions. When the landfill gas first arrives at the plant, it is compressed and cooled until any water vapor condenses. The condensate is collected and sent to the nearby leachate treatment plant. The compressed gas goes through a pre-treatment process that removes hydrogen sulfide, followed by a treatment process to remove carbon dioxide. The City of New York sells the purified natural gas to National Grid, which distributes the gas to Staten Island residents for cooking and heating fuel. As of 2018, the system collects about 3 million cubic feet of landfill gas per day, purified to produce about 1.5 million cubic feet of methane. As is typical in landfills, the amount of gas produced by the landfill has decreased over time. Monitoring data indicates that the methane concentrations in the landfill gas are now safely below regulated thresholds. DSNY is making plans to decommission the gas collection and treatment system in the next few years. Decommissioning is a multi-step process that involves testing, data collection and reporting to DEC to obtain their agreement. DSNY has proposed an initial pilot test during which the collection and treatment system is turned off and air quality at passive vent locations is tested on a regular basis. DEC will review the monitoring data before making a final decision about shutting down the systems. Once decommissioning is approved, both the collection and treatment systems will be permanently shut down and then demolished. The above ground extraction wells and flare stations will be removed from the mounds. Once the system is demolished, the remaining gas will be passively vented through an open pipe located at the former flare stations. At the treatment plant, leachate undergoes a series of physical and chemical processes to separate harmful materials from clean water. Leachate is created when rainwater percolates through decomposing garbage and picks up particles, including potential contaminants, from the garbage along the way. At Freshkills Park, the soil underlying the waste is made of a fine silt clay with low permeability. The clay has prevented the leachate from migrating into deeper layers of soils below the landfill. Around the mounds, trenches, cut-off walls, pipes, and pumps are designed to collect the leachate that migrates laterally through the mounds. The collected leachate is pumped to a treatment plant that separates the water from waste materials. Perforated pipes are installed in trenches 6-8 feet deep around the periphery of the mounds. Two of the mounds (East and West) also have containment (slurry) walls installed for an additional level of containment. These systems collect leachate and prevent off-site migration. The pipes are connected to pumping stations that pump the leachate to the treatment plant. The leachate treatment plant was updated in 1994. As of 2018, it treats about 300,000 gallons of leachate per day. At the plant, leachate is treated biologically with anaerobic bacteria that break down any remaining organic matter. Sodium hydroxide and aluminum sulfate are added to the leachate to transform any soluble metals into their non-soluble (solid) form. The mixture of solids and liquid is then sent to a clarifier where the solids settle out and are removed. The solids are dewatered and compressed into sludge cakes that can be transported to other facilities in New York City for further treatment. The remaining liquid is filtered through sand, which captures any remaining solids, before being discharged into the Arthur Kill. Before being discharged to the Arthur Kill, clean water is tested to ensure that it meets the discharge limits set by DEC.
DSNY is in the process of decommissioning the leachate collection system on all four mounds, one by one. DSNY started with North and South Mounds because they have been closed the longest and were expected to have less leachate. On the basis of long term monitoring data, DEC approved DSNY’s request to shut off the leachate collection system at North and South mounds and collect groundwater monitoring data to determine whether there was any impact on the quality of the surrounding groundwater. No impact was found, so DSNY has shut down the leachate collection system on these two mounds and removed the above-ground equipment. Active leachate collection systems remain in operation on East and West Mounds. The New York State Department of Environmental Conservation (NYSDEC) Division of Solid and Hazardous Waste Materials regulates landfill closure and post-closure operations under 6 NYCRR Part 360, Solid Waste Management Facilities (Title 6 of the Official Compilation of Codes, Rules, and Regulation of the State of New York).